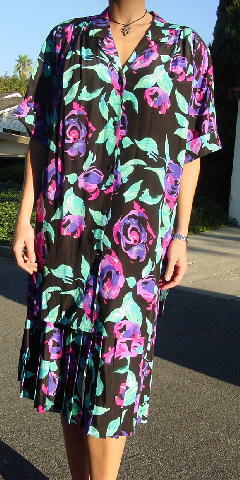 This vintage 100% rayon dress was made in the USA by Diane Von Furstenberg. The under slip/dress and skirt is black, see-through, sleeveless, and has a wide 11 3/4" V neckline and wide scoop back and it is attached to a lower pleated skirt. The long jacket has shoulder pads and short sleeves with cuffs at the ends. It has 5 black buttons down the front. The fabric has a nice sheen to it. 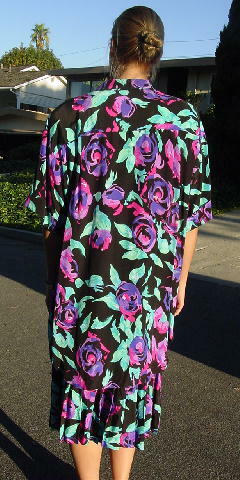 It has a flower and leaf design in purple, hot pink, lilac, white, seafoam, aqua, and light blue on a black background. The jacket has a shirttail styling. The jacket covers 4 3/4" of the skirt in the front and the shorter sides cover about 3/4" of the skirt. The tag says size 16. She wore it from daytime into evening by changing her accessories (shoes, purse, and jewelry). She even wore it to another model's wedding. She sold it because she was photographed wearing it too many times. shoulder to end of sleeve 10"
shoulder to top of skirt 29 1/4"